Are you looking for an exercise class, but the usual active class is not suitable. Then why not try an EXTEND Exercise class? Whether you have recently retired or determined to improve your fitness level, EXTEND Exercise can help you to achieve this. 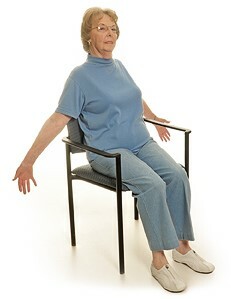 EXTEND Exercise classes are performed while seated in chairs, although it includes some standing work while holding onto chairs. Don’t be discouraged by this description, for these seated exercises can be quite energetic. You will be amazed at just how much active exercise can be performed while sitting in a chair! Our qualified EXTEND Exercise teachers are trained in a unique way to make exercise fun but at the same time safe. The aim is to reduce the symptoms of age-related conditions and improve mobility for persons with disabilities. Regular weekly classes are a great way of making new friends, too. The classes are held during the day and the sessions usually last 45 minutes. A Safe to Exercise questionnaire will need to be completed before joining a class.